The Scullion by Jean-Baptiste Simeon Chardin, Part 10 of the Introduction to Art and Artists of Our Time. 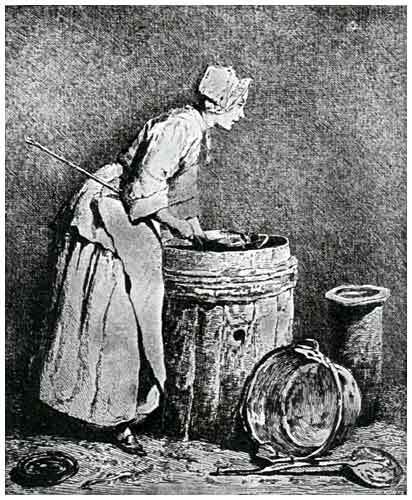 From the picture by Jean-Baptiste Simeon Chardin. JEAN-BAPTISTE-SIMEON CHARDIN comes next in time to Watteau, and he precedes Boucher, Greuze and Fragonard, but we have preferred to group these four together, since although each has his own strongly marked character, yet they are nevertheless affiliated by their subjects and by their mode of treatment, while Chardin is distinctly separated from them in both respects. He occupies a place apart. His subjects never led him upon dangerous ground, nor was it ever in his thought to teach morality, even by implication. He came of humble parentage like Boucher, Fragonard, and Greuze; but, unlike them, he did not aspire to a place in the world of the great. His father, Jean Chardin, was a master cabinet-maker, who was distinguished in his trade as the maker of the King's billiard-tables; sumptuous objects, designed as much for the eye as for the comfort of the players. His means were small, and he saw no better outlook for his children than to give them trades by which to earn their living. To this end, he taught his own trade to his son Jean-Baptiste, with the design of making him first his assistant, and then his successor; but the inclination of the boy for art was too strong to be controlled, and yielding unwillingly to his desire to become a painter, his father placed him with Cazes, one of the King's painters, who was then in fashion. Cazes taught young Chardin nothing; he set his pupil at copying his own pictures and allowed him to study in the evenings at the Academy, but this was all he could do for him. Chardin, discouraged with the little progress he made, looked elsewhere for assistance, and by a happy accident - if there be such a thing as accident in the world - he found what he looked for in the studio of a distinguished painter, Nicolas Coypel, who invited him to assist him in painting-in some of the details of his pictures. Coypel gave him a gun to paint, and impressed upon him the necessity of copying it with great care. Chardin was surprised at the pains his new master took to adjust the gun, and to light it as it was to appear in the picture. It was the first time he had been set to work at copying the actual model. In Caze's studio he would have been allowed to design the gun from his moral consciousness, as the German did the camel in the familiar old story. But Coypel's teaching was a door opened upon a new world. His own instinct answered to the invitation. Coypel had, in fact, only taught him what he knew already; to quote de Goncourt: "The truth, light, painting, his art, the secret of seeing and painting - all these were revealed to him in a flash, in the light of day, by means of a simple accessory in a picture." It was long, however, before Chardin found a way open for his talent. He was only a workman paid by the day, called on to put his hand to any job of the moment that might turn up, "one day painting-in an accessory in a portrait, another day employed in the restoration of a gallery at Fontainebleau under Vanloo." This practical sort of training, a rude apprenticeship, not peculiar to Chardin, but served by all the artists of the time, in every country, was all that Chardin found available; but like every man who is worth anything in the world, he refused to waste his time in complaining of what he could not help, and worked honestly at each day's duties, hoping for better times. By degrees success came to him. It began without much promise, with the painting of a sign for a surgeon, a friend of his father, who wanted it for his shop. Surgery at that time was hardly disengaged from its alliance with the humbler arts; it meant little more than tooth-drawing, blood-letting and bone-setting, and was for the most part a mere accessory to the barber's trade, as it is to-day in the ruder quarters of Italy and Spain. "Chardin, who had seen," says de Goncourt, "the sign which Watteau had painted for his friend Gersaint, undertook to paint a similar scene for his new client. He imagined a Barber-surgeon going to the assistance of a man who has been wounded in a duel and brought to the door of his shop. Chardin crowded the scene with all the bustle and confusion that belonged to such an incident; the water-carrier sets down his pails; dogs are barking; a man with a push-cart hurries to the spot, hoping for a job; by the door a woman, perhaps "the woman in the case," leans half fainting. In the background there is a hurly-burly of street-loafers, a crowd of curious people who huddle together, press upon one another and try to get sight of what is going on. The policeman holds back the mob with his crossed musket. The wounded man, stripped to his waist, showing the wound in his side, held up by a sister of charity, is bled by the surgeon and his assistant. The notary, in his official wig, sent to take cognizance of the affair, walks slowly up with the grave air of justice personified, followed by his lean clerk all dressed in black. All was painted to the life, and when the sign was finished it was hoisted to its place early in the morning before any one in the house was stirring. A crowd gathered about the shop; everybody was delighted; they laughed and chattered and cheered until at length the barber-surgeon must come out to see what was the matter. He saw the sign; it was not what he had expected. He had looked for nothing more than the usual painted catalogue of implements of his trade, and at first he was inclined to be angry, but the delight of the crowd disarmed him. The fame of the picture spread; it became the talk of Paris, and it was by means of this humble sign that the name of Chardin became known to the Academy. Once again he appealed to the suffrages of the public, and at an open-air exhibition on a holiday he showed a painted bas-relief where his skill in deceiving the eye pleased not only the crowd but a good painter as well, Carl Vanloo, who bought the picture for himself and paid Chardin a better price than he had sought for it. His father, too, pleased with his modest success, paid for him the fees necessary to make him a member of the Academy of Saint Luke. But this Society did not long survive, and Chardin was again thrown upon his own efforts. In 1728, at another of these improvised open-air exhibitions, Chardin showed his picture "The Ray-fish," which is now in the Louvre, where it is called in the Catalogue "Interieur de Cuisine." Upon a kitchen-table at the left hand, a ray-fish cut open is lying, along with two other fish and some oysters. A cat is looking at these things. On the other side of the table on a cloth there is a large glazed earthen pot, a knife, a copper basin, a stone jug, and a strainer leaning against a cauldron. The world has long admired this master-piece of realism, rivalling the Dutch perfection; we may imagine the effect it produced on the unsophisticated public, when seen in that informal open-air exhibition on the Place Dauphine. But it was not the multitude alone who applauded. They were taken by the truth with which the every-day objects familiar to them were represented; but the Academicians who saw the picture were struck by the skill of the painting; they called upon Chardin and urged him to present himself as a candidate for the Academy. He was made a member of the Academy as a painter of fruits, flowers, and genre subjects in 1728. Chardin has had the good fortune to make himself a favorite alike with the public and the artists, and his reputation has steadily gained with time, until at the present day he is counted without reserve among the masters in his own domain, not only by his own countrymen but by the world at large. His subjects please the people; his way of painting is the delight of artists, and their despair as well, for the greatest still-life and genre painters of our time are constantly confronted with the spectre of Chardin; his laurels keep them from sleeping contented with their own. There is one source of pleasure to be found, not only in Chardin but in all the painters of the time, the obscure as well as the famous. All these artists found ample material for their pictures in their own country, in their own immediate time, in the manners of their own people, whether in the court, the houses of the bourgeois, or the cottages of the poor. Not only so, but the materials of their still-life pictures were all the familiar objects of their daily life and of that of their friends and neighbors. This gives their pictures a verity, a historical value, and even an artistic force that the coming time will certainly miss in the pictures of our own day. Chardin is eminently a painter of still-life, and, like the Dutch painters from whom he inherits, he finds his models not in the bric-a-brac shops or in the museums, but in his own kitchen or the kitchens of his friends, or in the fruit-stalls and market-stands of his quarter of Paris. These pots and pans, jugs and cauldrons, with now and then a silver goblet or a drinking-glass, are not posing, as too often seems to be the case in similar compositions in our own time; nor are they selected for their beauty or their curiousness; they are just the honest, homely, unpretending things the artist know by heart from seeing them in daily use. "He seems," says de Goncourt, "to have hardly taken the pains to compose his subjects, but to have painted what he had at hand, only anxious to paint it with the utmost truth." One of his most admirable pictures has for its subject nothing but a silver goblet with some fruit lying on the table near it. Another is a drinking-glass with three chestnuts and three nuts of another kind. Or he paints flowers, and the same perfection that he has brought to the reflections of the cherries in his goblet and of the nuts in his glass, attends his pinks and tuberoses and sweet-peas. Only we must not look to Chardin for color; this charm is not his; it is a charm to which French art in his time was a stranger and which in our own day is looked upon by the French as of secondary value, or if they praise it, it is because they mean by color something very different from what was understood by it in Venice, or in Florence in the early time. What Chardin did attain was the truth of light, truth of modeling, and an absolute faithfulness of character. It has been said that Chardin did not attempt portraiture nor the painting of the figure until late, or at any rate until his reputation as a painter of still-life was established. But this is not to be taken literally. We have only to remember that his very first picture, the barber-surgeon's sign, was nothing else but an elaborate figure-piece; and if he did not at first pursue his art in that direction it was perhaps because he found the public so well pleased with the less exacting subjects that he had no prcuniary motive to change them for others. But the change when it came was by no means so sudden as the anecdote quoted by M. de Goncourt would imply. According to this story, Chardin was living in close intimacy with a portrait-painter named Aved, and it happened that one day when they were together, Chardin was engaged on a canvas intended to ornament the chimney-pier of a dining-room, and which had for subject a table covered with a white cloth on which were disposed two glasses, one of them overturned, a knife, and a silver plate with a sausage. In front of the table was an earthen pot and a bottle of wine in a cooler. As he was painting, a lady entered who came to consult with Aved about her portrait, which she wished him to paint, and for which she offered him - it was to be a half-length - four hundred francs. Aved thought the sum too small, and declined the commission. When the lady had gone, Chardin remonstrated with his friend, saying that four hundred francs was always a good thing to have in the house. "Certainly," said Aved, "if a portrait were as easy to paint as a sausage!" Vexed by this sally, and thinking it might be as well for him to try the public favor with a new part, Chardin, so the story goes, essayed the figure, and found a new vocation. The history of artists is full of such anecdotes, easy explanations, often invented to suit facts as fictitious as themselves. M. de Goncourt, too sagacious to credit the anecdote, has brought forward a number of facts well established, to show that the change from the still-life to the figure was a gradual one. He gives a list of all Chardin's sendings to the Salon, from 1737, the first year, to 1779, the year of his death, and from this it appears that out of over a hundred pictures about sixty are either figure-subjects, portraits, or heads. For the first ten years, from 1737 to 1747, all his contributions to the Salon were figure-subjects or portraits, and many of these were among his best works. The subjects which he chose in this field were trifling in themselves, and owed their popularity to the simplicity and directness with which the characters he portrayed were seized, while artists admired the large and free style of the painting, qualities that have held their own down to the present time. They were such as these: " Woman drawing Water from a Copper-fountain" - this is considered one of his best pictures; "A Young Man amusing Himself with Cards," "A little Girl amusing Herself with her Breakfast," "A Scullion" - the picture we copy - "A young Woman sealing a Letter," "The House-provider" - a servant returning from market. Chardin also painted children very prettily, and he had a fancy, as Decamps had after him, for representing monkeys employed in human occupations: A "Monkey painting," "A Monkey as a Philosopher," etc., etc. In all these pictures we see revealed a frank, honest, clean spirit, without imagination, without fancy, but also without the sensuality, or the double meanings, and loose suggestions of Greuze, or the open and unblushing freedom of Boucher and Fragonard. As we have said, these pictures of Chardin gave great pleasure; they appealed to the mass of his countrymen, who liked to see themselves and their manners reflected in so faithful a mirror; and when the pictures were engraved, as they were almost as soon as they were painted, the prints were so warmly welcomed that the demand for them could hardly be supplied. They went all over France and were found in every house; the rich bought them as eagerly as those of moderate means. The engravings were made by the best artists of the time; by the two Cochins, the father and the son, by Lepicie, the two Lebas, and others of equal merit, and they are still admired and sought for. But they are no longer to be had for a franc apiece, as they were in Cochin's day. Even his pictures were sold for prices that to-day would be reckoned low for the engravings made from them. He, himself, did not place a high value upon his work. On one occasion his friend Lebas, the engraver, came to see him, and greatly admiring a picture he was at, expressed a desire to own it. "That can be easily arranged," said Chardin; "I like your waistcoat!" Lebas took off his waistcoat, gave it to Chardin, and carried off the picture. "The good-natured man," says De Goncourt, "that is what Chardin appears among the painters of his time. Modest in prosperity, he was often heard to say: 'Painting is an island, and I have only sailed along the shores of it.' Devoid of jealousy, he surrounded himself with the pictures and the drawings of his contemporaries. He had a fatherly way with young people; he was indulgent to beginners. Like all men of true talent he had charity in his mind and in his heart." In 1757 Chardin had been given lodgings in the Louvre, where, in his day and for many years later, a number of artists and their families lived and had their studios free of rent, by permission of the crown. Since the year 1752 he had received from the King an allowance of 800 francs, and this was increased later to 1200 francs. He was a laborious, pains-taking painter, and during his sixty years of active work he produced comparatively few pictures. From the scarcity of his drawings and sketches it is concluded that he began and finished his pictures directly from life. He was so much more of a painter, in the technical sense of the term, than any of his contemporaries, that his way of painting was the cause of much curiosity and speculation on the part of artists and amateurs. The boldness and vigor of his handling gave people to think that he painted with great rapidity, and in Le Biographie Universelle he is represented as eating to-day the ray-fish which he had painted the day before. Among other gossip it was said that he never allowed any one to see him at work, and that he painted with his thumb and not with his brush. "It was thought impossible," says de Goncourt, "that any one could paint as he painted, in painting with the ordinary materials used by all other painters." Chardin died in 1799, in his lodgings in the Louvre, and was buried in the neighboring church of Saint-Germain l'Auxerrois. He was just turned eighty years of age. During the last years of his life he suffered much from ill-health and disappointment, and from the death of his only son, a youth of promise, whom he had looked upon as his successor in his art, and who had carried off the Grand Prize of the Academy in 1754. Chardin continued to work at his easel until the end, and only a few years before his death he took up the art of pastel painting and produced some excellent work. The Salon of 1799 contained several heads in pastel by him, and in the Louvre, along with several of his best works, are two remarkable pastels: the portrait of himself and the portrait of his second wife, Marguerite Pouget.